Feeding German Shepherds? 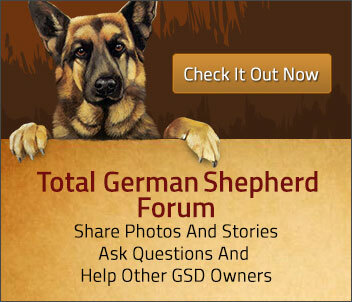 What are you feeding your GSD? There are many different and great brands and types of dog foods on the market. There are even foods by Royal Canin and other brands specifically formulated for the German Shepherd breed. No matter which food you use, the idea first is to get a high quality puppy/dog food recommended and currently used by your breeder or rescue and keep your dog on it. If at all possible I recommend you buy the highest quality dog food that you can afford for your dog or puppy. If you need to change the diet of the German Shepherd later on for some reason then do your research accordingly and well ahead of time because feeding German Shepherds a good diet is very important. And if you occasionally find them eating grass, don't worry. Some puppies can suffer from stress after leaving the kennel which in turn could develop into diarrhea. If you keep the puppy on the same food and on the same feeding schedule that the breeder used it will help to relieve stress and keep the puppy’s tummy settled. If you experience loose stools, poor coat quality, etc., with your German Shepherd, and you have ruled out many other potential problems then chances are high that another food is needed because your dog is not getting all it needs from it's current food.Feeding German Shepherds a good quality food is very important. I do not suggest that you go hopping from one dog food to another in your search for a new dog food, however, you need to do your research first - read labels, speak to your vet, your breeder and other pet owners, then switch - if you find a good quality food that your GSD enjoys (and is doing well on) then stay with that food. Concerning a German Shepherd puppy and it’s diet, one of the best guidelines to follow is to watch the weight of your puppy as well as the coat condition and the actual “poops” it produces. If your GSD puppy has a poor coat, bad “poops”, maintains a low energy level or just doesn’t act like a normal, healthy, energetic puppy, then chances are high that poor diet is the cause. Get your puppy to the vet for a check up to rule out any other causes such as worms and then discuss with them the chances of changing to another better food and ask for suggestions on one to choose when you are feeding German Shepherds. Some people strongly advocate a raw foods diet. I, myself, have no experience with this form of feeding German Shepherds but if you are interested in learning more about the BARF (Bones and Raw Foods) diet for your dog, please do more research online concerning Raw Feeding. 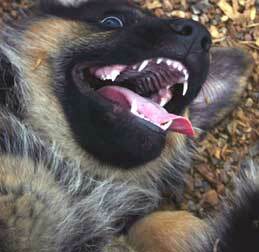 I recommend feeding young GSD puppies 3-4 times a day until they are around 3-4 months old at least. I also understand that sometimes this is just not possible. If this is the case, feed your GSD puppy at least twice daily, once in the morning and once in the evening. I feed twice daily, even with my adults. I do not like giving my dogs their entire daily quantity of food in one meal, plus I enjoy spending the extra time with them and this extra feeding does just that for me (and more so). Actually, there are many scientific studies indicating that feeding twice daily (or more) is a good defense against your dog becoming bloated. 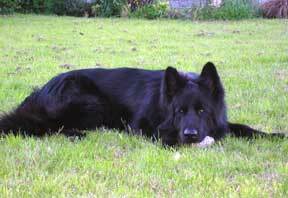 Keep in mind, when feeding German Shepherds you do not want your dog to be very active either before or directly after you feed them. Once they've eaten give them at least a couple of hours of rest for the food to have time to digest properly before further physical activity. The same needs to be followed before your dog eats as well. Limiting all physical activity before and after meals is an excellent way to keep your dog from getting bloat. Next question: When should an owner quit feeding their GSD puppy puppy food and switch them to adult food? This issue is a very controversial and complex one. I always suggest that new owners keep their GSD puppies on puppy food until at least 7-9 months or longer, depending on the individual puppy.My thinking is this, if the GSD puppy is doing well on the puppy food and is maturing properly, not too slow, not too fast, then I see no need in changing the food just for the sake of changing the food. Here's what you should do if you don't agree with me (and I won't be upset, I promise): do a little research on your own, speak to your veterinarian and let them give you the pros and cons of when to make the food change. In the end you will probably have to vary the quantity of food according to the special demands, age and activities of your own dog anyway. Metabolism varies in dogs just as it does in humans, so this makes it impossible anyway to have any hard and fast rules as to quantities of food in the first place. The best guide in many ways, is to carefully observe the weight of your own dog and to use this as your starting points. You don't want them too heavy, or too thin as well and feeding German Shepherds can take time to learn exactly how much is needed. It is important to note here that as the dog ages they will probably require much less food as well. • Don’t let your children approach a dog that is eating (in or out of a crate)! • All dogs should be fed at least twice a day to avoid getting “bloat”. • After feeding the dog, don’t run/or play with it for at least 1 hour!! Love the Royal Canin for German Shepherds!